This Commercial Grade Kennel Door will accommodate Dogs up to 100 lbs and 11 3/4″ shoulder width. This is our Chew Proof design made for those problem chewing big breeds. Comes in Door mount and Wall mount. 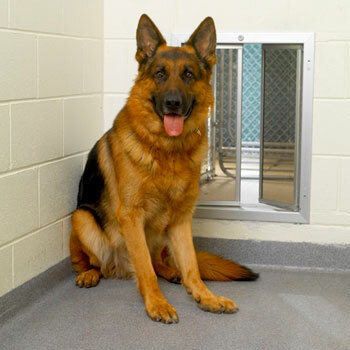 The Bite Guard KennelPlex 1418 system is designed for large breed dogs including Pit bulls, Labradors, German Shepherds, and all dogs up to 100 lbs an less then 11 3/4″ shoulder width. This is our new Chew Proof design. The panels have a aluminum edge protector to prevent those strong jaws from grabbing onto the panels. The smooth shape helps prevents any tooth damage as well. The lock is cone shaped to allow teeth to slide off with out hurting your big dog. 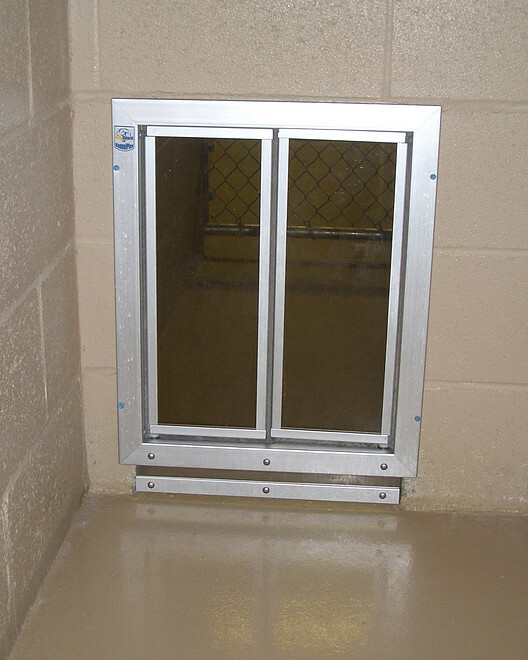 The Bite Guard KennelPlex series is made of solid heavy duty aluminum frame with stainless steel parts. So cleaning with a pressure washer make it quick and easy. 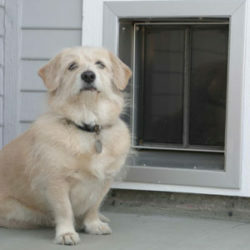 The K-9 COMPOSITE panels are molded to form a “dual thermo-pane” for excellent insulation. 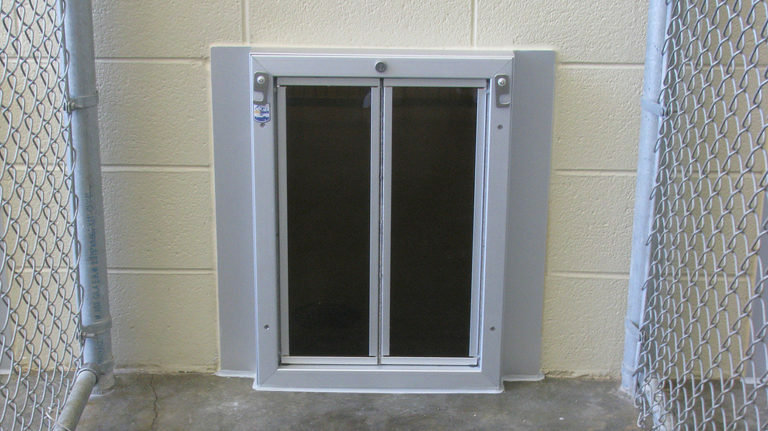 Both panels are lined with high-density, nylon pile weather seal for superior draft-control. 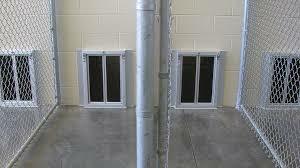 Doors close tight keeping the heating and cooling inside your home. Ideal for extreme climates. Keeps unwanted guests out of your home. Insert the key to lock or unlock the door. Apply the steel security plate when leaving for an extended period. 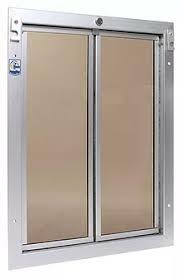 Hardened aluminum interior and exterior frames won’t rust, bend, crack, or warp. The Bite Guard comes with a Five Year warranty. The Bite Guard comes with options that fit your needs. 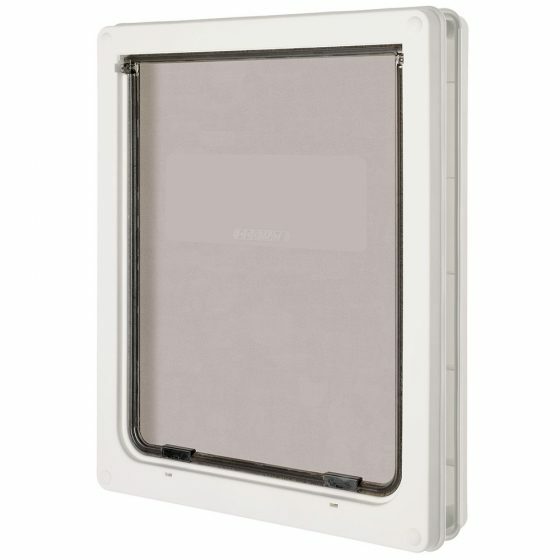 The Stay Open Hook option allow for the panels to stay in the open position to allow multiple pets to run in and out as needed. 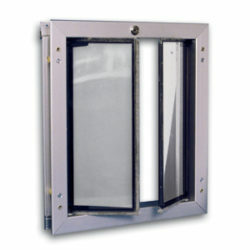 The Center Mount Hole – Outer Mount Hole gives you the option to mount on cinder block or wood frame. The Riv Nut option gives you the freedom of using a cover plate and exterior frame option to prevent rain from dripping in. It comes in Door mount and Wall mount.